13 month old neo puppy, she is 115 lbs already, going to be a big girl. 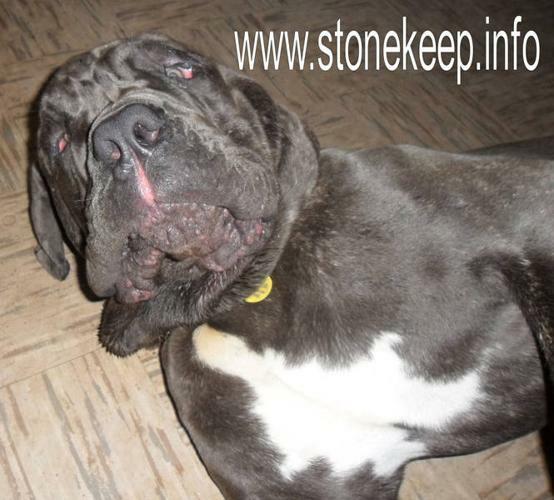 She is a beautiful pup with lots of type, great expresion, abundant wrinkle, thick bone and massive size. She is submissive and sweet to us, her owners and loves attention. She is bouncy when playing but generally a quiet dog who isn't in your face when you come in, she is happy to see you but will usually waight for you to call her over to give affection. She is house broken in every way, but not crate trained. She is leary of strangers and protective of family. Not good with kids as she has limited exposure and has never been introduced to any kids by someone with proper experience to do it right. Not good for breeding or show as she has some faults such as roached back and odd movement so she must be spayed!! She will be on a contact to enshure this happens. Looking for a great home where she will be spayed and have her cherry eyes done. Will only go to experienced owner. If you don't know the breed please don't bother to apply to adopt her. Refferences must be provided. Neapolitan mastiffs are NOT Gentle Giants, they are Gladiators used in the colluseum and on the battle field. They are loyal protecters of property and family and as such need an owner who is experienced with the handling of this type of mind set.